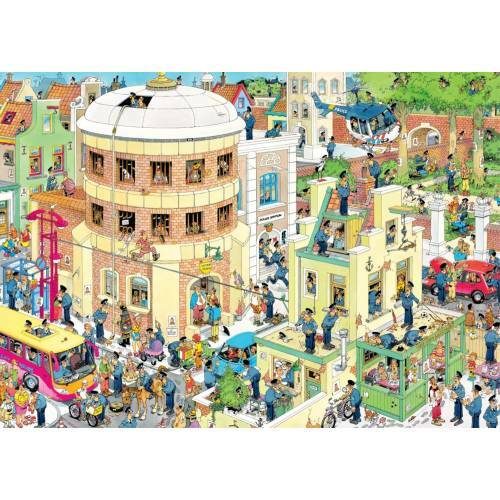 Jan van Haasteren's 'The Escape' is a fantastic brightly coloured 1,000 piece jigsaw puzzle with plenty to look out for in the highly detailed puzzle image. 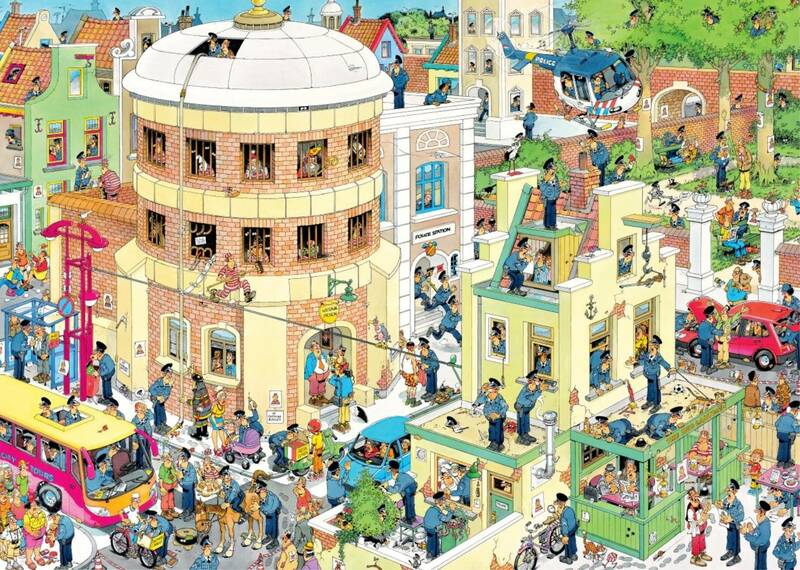 If you look carefully at the puzzle image you will get a taste for Jan's level of humour that depicts a chaotic city centre that has been brought to a stand-still as the local police continue their search for the prison escapees. Can you help the police try and find where the escapees are hiding or trying to make their big break from? Are they in the trees, on the top of the buildings or even right underway the nose of the police officers? If this little taste of what is included in the puzzle image is to your liking, then this 1,000 piece puzzle will keep you entertained. What is most noticeable in this hilarious jigsaw puzzle is the extremely high level of detail and use of colours to make this puzzle even better. If you are already a fan of Jan van Haasteren's you will probably be looking for Jan's trademark - the shark's fin - featured in all of his puzzles. You will also see other of Jan's favourites - Saint Nicholas, The Hands and The Dentures all feature in this puzzle. If you have not done a puzzle of Jan's before, be sure to look out for all of these things - you will find them in most of his images. 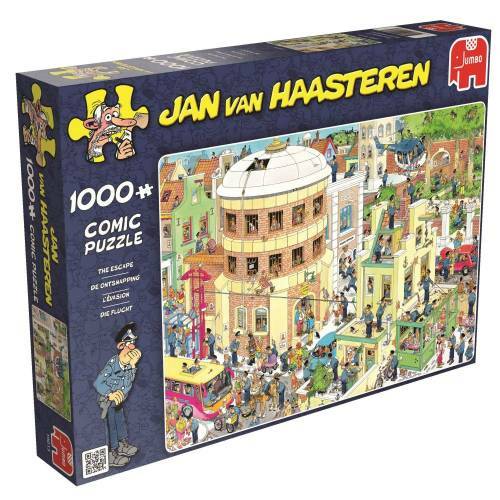 Jan van Haasteren has been creating amusing drawings exclusively for Jumbo for several decades. His drawings have a distinctive, easily recognisable, style - humorous images, hilarious situations and far more people than you would ever expect to see in a jigsaw puzzle! The completed puzzle measures 68x49cm (approximately) and has been produced using a high quality cardboard to ensure all the jigsaw pieces maintain their original shape time and time again. With the use of Jumbo's precision cutting techniques, each jigsaw piece will fit seamlessly together to create a poster-like finish for you.